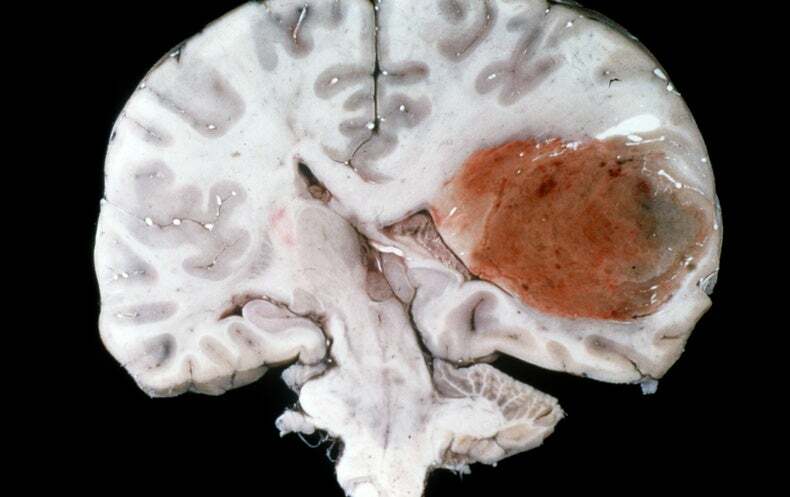 The most common form of malignant brain cancer—called a glioblastoma—is notoriously wily and considered the deadliest human cancer. Glioblastomas charge their way into normal brain tissue diffusely and erratically, making them surgical nightmares. And they mutate at such a rapid rate that most currently available cancer treatments can't keep up with them. Even neighboring tumor cells can be genetically distinct, and therefore hard to target with a single therapy. Survival rates from glioblastomas enjoyed a modest bump in the 1980s when radiation became a standard part of the treatment protocol. Patients could expect to live for nearly another year after diagnosis, up from just four to six months. The introduction of the chemotherapy drug temozolomide in the 2000s increased survival another few months. But since then patient survival rates have stalled. In recent years, glioblastomas famously claimed the lives of senators Ted Kennedy and John McCain, and Joe Biden’s son Beau. Even access to what was presumably some of our country’s best cancer care couldn’t save the high-profile politicos. New approaches to treating this scourge of the brain are desperately needed. And many experts insist the key to beating glioblastoma will entail personalizing care to a patient’s individual tumor and the particular molecular signature of a cancer. One method of testing cancer therapies, including glioblastomas, has been so-called “ex vivo” cancer models, in which malignant cells are probed in the lab. Also known as tumor “avatars,” they allow researchers to test a drug on patients’ cancer cells before introducing it into their bodies. A number of ex vivo models have been tried over the years: culturing tumor cells in Petri dishes; grafting them into animal models; even growing “organoids” (three-dimensional tumors grown on a supporting matrix). These techniques have seen varying success depending on the tumor type at hand, but none have proven especially helpful for glioblastoma. A report on new research technology published recently in the journal Nature Biomedical Engineering may address the limitations of previous ex vivo approaches. In short, researchers have concocted a glioblastoma-on-a-chip. Chip-based models of various organs and diseases—including many cancers—have debuted in the last few years. They are constructed by lining a plastic microchip with live human cells that mimic a particular organ or disease in order to simplify, cheapen and increase the efficiency of drug testing. The Wyss Institute at Harvard University and other groups have made impressive headway in developing a number of chip-based biologic models. Chip models of the lung, the intestine, skin, bone marrow ALS—even the blood-brain barrier—have been tested. The new report of a chip from researchers in South Korea may represent the most advanced ex vivo model of a glioblastoma to date. The authors used bioprinting technology to put brain tumor cells from human patients on the chip alongside blood vessel–like cells printed in a ring around the tumor, mimicking the vital oxygen supply required by a glioblastoma. Further away from an air supply, the cells at the center of glioblastomas in humans tend to die and form a necrotic core. Finally, the researchers also incorporated an “extracellular matrix” into their model, the three-dimensional network of connective tissue, enzymes and other proteins that support animal cells, including tumors. This matrix is thought to play an essential role in how cancer behaves in the body. The new model successfully mimicked the treatment responses seen in the patients from which the tumor samples were derived. Chip tumors from patients highly resistant to the standard glioblastoma treatment regimen—radiation combined with temozolomide—did not respond to therapy. Tumors printed from less resistant patients were, in turn, found to be more responsive to treatment. “To the best of my knowledge, we have bioprinted cancer-on-a-chip for the first time,” says Dong-Woo Cho, a professor in the Department of Mechanical Engineering at Pohang University of Science and Technology in South Korea, and senior author of the new report. “Furthermore, our study is the first attempt to actually reproduce the patient’s therapeutic responses with personalized cancer-on-a-chip.” Cho believes that eventually their chip model could help prolong survival in patients with glioblastomas by guiding appropriate treatment selection. “I believe the day when we test cancer cells derived from patients that are cultured with a platform that mimics real cancer biology will come soon,” he says. Sanai directs Barrow’s Ivy Brain Tumor Center, a collaboration with the Ivy Foundation dedicated to one day curing brain cancer (Barrow treats more brain tumor patients than any other site in the U.S.). As part of his role as director, he oversees the center’s “phase 0” clinical trials program. Phase 0 trials are means of better customizing drug therapy to each specific patient. During such a trial, a genetic analysis is performed on previous surgical tumor samples from a given patient to help determine which combination of experimental drugs makes the most sense to try. Many of the drugs they experiment with are already being tested for other cancer types, so they often have some degree of a proven safety record. Next, prior to a patient undergoing a follow-up surgery to remove a newly grown tumor, Sanai and his team administer their chosen chemotherapeutic drug cocktail. The goal is to address two questions: is their drug regimen actually getting to the tumor, and is it attacking the molecular targets it was intended to? Sanai laments that while ex vivo models of other cancer types can be fairly faithful representations of their human counterpart, this just isn’t true for glioblastoma. The blood-brain barrier forms a rather impenetrable citadel around the organ, so getting a drug past it remains a challenge. Knowing whether or not a drug is even getting to the brain—and that it’s working to eradicate tumor cells, the goal of a Phase 0 trial—could be a huge boon to therapy selection. After his patient’s surgeries, Sanai and his team spend a week or so analyzing the excised tumor while the patient recovers. At that point they usually have a good idea of whether their drug regimen could prove to be a good candidate. If so, the patient is treated. “If not, we may pivot them to another therapy; to another trial,” he says. Sanai acknowledges that even if a patient benefits from a phase 0 trial, the tumor will in all likelihood mutate and recur. “They’ll land back in the OR,” he says, “and we’ll ask ourselves, ‘Okay, how did this tumor change? Why did it stop responding?’” This, he says, informs the team as to what the next collection of drugs should be. Treating glioblastoma seems like a Sisyphean undertaking. Even pancreatic cancer, widely considered the second grimmest cancer diagnosis, has a few consistent genetic blips that suggest a common therapy among patients is a possibility. While this wasn’t thought to be the case with glioblastoma, encouraging research continues to trickle in. A study published last week in Cancer Cell, reported on three specific genetic alterations that appear to drive the early development of glioblastomas. Researchers from the German Cancer Research Center tested glioblastoma samples from 50 patients, including both their initial tumor as well as any recurrences. By analyzing tumor genomes they were able to trace back how these tumors had mutated and evolved. They found that on average the glioblastomas had developed for up to seven years prior to diagnosis, a surprising discovery given the rapid rate these cancers are presumed to proliferate. The investigators found that all of the tested glioblastomas had at least one of three specific genetic alterations early in their development. These were either complete or partial gain of chromosome 7 or 10, or a loss of part of chromosome 9. These genetic alterations only appear to drive tumor growth early in glioblastoma development. Recurrent tumors, by contrast, didn’t appear to have specific mutations common among them. This suggests that current glioblastoma treatments aren’t creating a selective pressure and driving the formation of resistant recurrent tumors. The implication of these results is that the failure of so many investigational drugs in glioblastoma is because they’re not effectively attacking the tumor, compared to the alternative scenario of the cancer outrunning a potentially effective treatment by mutating. The authors contend their work suggests that we urgently need new treatments for glioblastoma. Sanai, for his part, suggests that in the future the whole concept of glioblastomas may evolve. “Right now, we tend to think of glioblastoma as a single disease,” he says. “However, we’re already dividing it into subsets with unique biologic profiles.” He believes that there aren’t just a few glioblastoma subtypes, but probably hundreds, if not more.